tonite, it's not finished, but i love it so much already that i couldn't wait! i'm working on framed monograms to go above the beds, plus a whole photo wall on sashi's side, a fuzzy pink rug, a beautiful crystal lamp, and an ottoman to sit in front of the vanity. but for tonite, it's gorgeous in it's we're-getting-there state, and pookie loves it. personally, i'd paint the walls a soft grey-blue and change the purple curtains to pink, but it's not my room, and this girl loves COLOR! so, color it we will. 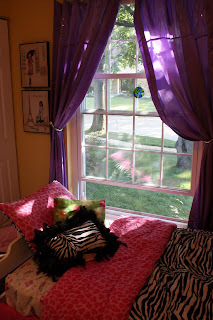 zebra stripes, hot pink fuzzy rugs, and purple curtains. with yellow walls. it's perfect! i have so many favorites already - like the sassy prints from target there on the left side of the window. they don't scream tropical, but pookie agreed that the lines, look, the locations and colors in the pictures were her to a T, so she agreed, and we we put them right where they'll fit best. 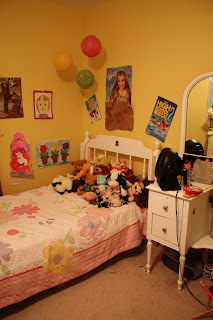 on the photo above, you can see her 'art wall' - glitzed up with traditional gallery black paint - old cork boards (and a couple new magnetized new ones, too) spray painted to display pookie's many creations. there's a skinny little frame on the bottom that is an old $ frame from walmart i've had for years and intended to do something with one day, but instead, we spray painted it with chalkboard paint for today. currently, pookie is proclaiming on it's sleekness that she loves her family. another night, she'll write something else in another chalk color. it's up to her. 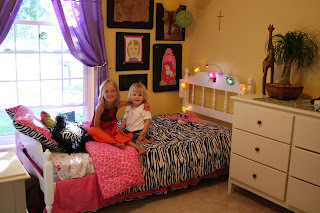 it's her room - and her art in that corner! we'll share more as we shell out the $$, but i just couldn't wait!